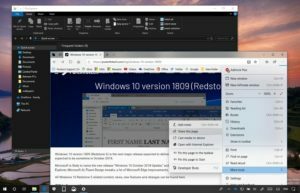 Home Blog Here are the new features in the Windows 10 October 2018 v1809 update. Posted by cci34900 on Sep 27, 2018 in Blog, Uncategorized | Comments Off on Here are the new features in the Windows 10 October 2018 v1809 update. Microsoft will start rolling out the next major feature update for Windows 10 next month. Called Windows 10 October 2018 v1809 Update. Windows 10 v1809 brings in a host of new features and improvements. Dedicated HD / HDR Settings: Windows now offers a new Windows HD color page which lets you configure HDR settings. Work from different Regions? If yes, you can change the regional format settings like Calendar, First day of the week, Currency, Dates, Times, and Currency. Keyboard: Typing insights are not available along with SwiftKey which now powers the touch and on-screen keyboards. Apart from that there are two subtle, but important changes. First, Focus Assist will automatically enable for all the games, and the mouse can be centered on the screen when using the magnifier tool. Edge Hub & UI: its settings page has been redesigned to give a HUB like look with an acrylic navigation pane. When it comes to UI, a lot of cosmetic changes including drop shadow tabs, icons instead of text, and you can now control which website can play the video automatically. If any website starts playing media, the volume icon will light up to draw your attention. Finally, a clipboard which is smart. The new clipboard experience not only syncs between devices, but you can also see the copied content by using the WIN+V shortcut. Sniping Experience: The current Sniping tool has been replaced with Screen Sketch tool which includes support for the freehand screenshot as well. A shortcut will be available in the action center for quick access. You can also configure to open Screen Sketch. Notepad is one of the apps that has got serious attention. It not only features line endings support for UNIX but also for Mac, i.e., LF and CR. You can choose to wrap around text to make sure they are not lost in infinity! Apart from you can Zoom in and out and also see line numbers. Making sure Bing is not left behind, right click and you can search on Bing. You can link directly into text boxes. When you clean install Windows 10 on a new PC, the OBE or Out of Box Experience setting will offer consumers to enable activity history sync. This means when they use the same account, they can start from where the left.